Simply superb audio quality with few, if any, drawbacks. Corsair's first speakers have to be heard to be believed. They're that good. You have to hand it to Corsair, it doesn't do things by half. Recent years have seen it branching gradually from the flash-and-RAM business into new areas, and each new product line has been approached with an eye to quality. Its PSUs, SSDs and gaming headsets may not be cheap, but by gum, they're good. 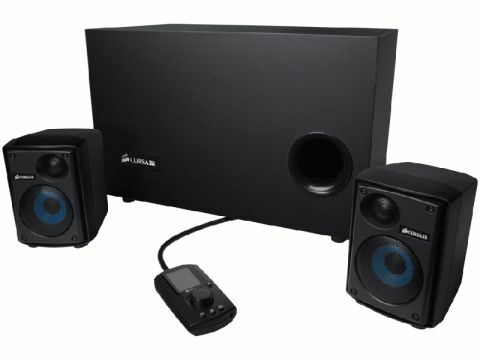 After the firm's first foray into gaming audio with the HS1 headset, Corsair now has its sights firmly set on the desktop speaker sector, and its first 2.1 speaker system, the SP2500, is nothing short of a revelation. The set comprises a desktop control unit, two reassuringly heavy satellites, and a truly titanic sub-woofer, comprising six amplifiers, and capable of a room-filling 232W of output. Setup is a breeze, and the colour-coded PSU-style plugs mean you simply cannot get your left and right satellites mixed up. Each satellite features a midrange driver and silk-domed tweeter, each of which is independently amplified to avoid signal-bleed between the midrange and treble, and it's a noticeable difference to the majority of desktop audio setups; the sense of spatial separation between unique sounds is excellent. Likewise, the fourth-order bandpass construction of the sub, which is essentially an internal partitioning system within the box that filters out undesirable frequencies to minimise distortion, leads to rich, resonant and surprisingly detailed bass-tones. All tidy innovations that look impressive on paper, and mean that the Corsair SP2500 doesn't come cheap – it'll set you back around £200. So how does the system sound?